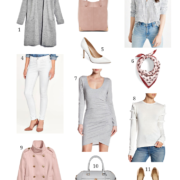 When I’m shopping for summer clothes, I usually try to zero in on elevated basics – items that I can easily mix & match with what I already have in my closet & things that are stylish, yet practical for my lifestyle. While it’s nice to have a few special pieces to pull out from time to time, I want to be smart about investing in versatile options that I can wear multiple ways. This outfit is a perfect example of a combination of pieces that I will reach for over and over again – and it’s ideal for a summer BBQ, picnic in the park or to wear on the 4th of July! This white denim skirt is exactly what I’ve been looking for – it has just the right amount of stretch & it’s not a stiff denim like others I’ve tried. I also love the raw hem & that the belt is removable which means I can style it so many different ways. If you prefer more of an a-line shape, this skirt is another great option. Other easy day skirts to check out include this floral skirt (love the elastic waist), this button-front style & this striped knit skirt (looks so comfy!). This halter top is such a fun modern take on stripes and it’s a silhouette that’s different from anything else I own. This would also be great with cut-offs or jeans with flat sandals. More summer tops that I’d pair with this skirt: this ruffled tank, this lace top, this printed camisole and this peplum tank. I’d be remiss if I didn’t mention these wedges, which are the most comfortable shoes I’ve ever worn. They come in 4 different neutral colors and trust me when I say they are worth every penny – I could literally walk for miles with no discomfort at all! Note: I recommend sizing down in both the top & skirt, but I did go up 1/2 a size in the wedges. As we’ve gotten busier with the kids’ schedules and family activities, I’ve found that shopping online is so much more convenient for me. So I love that Nordstrom offers free shipping & free returns, which makes it easy to order multiple sizes & return what doesn’t fit. But if you don’t want to wait to receive items in the mail, they also have a feature that allows you to reserve items online & try on in-store (plus free alterations, if you need them!). While they do carry several higher-end brands, I’ve found lots of great affordable options too & I’ve rounded up some of my favorites for you in the scrolling bar below! 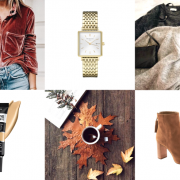 Thank you to Nordstrom and ShopStyle for kindly sponsoring this post.